Hot iron brands are the only instant, permanent cattle ID that are time tested for thousands of years with virtually no changes to the process. An electronic animal ID system has been the passion of USDA for over 18 years. Recently, Secretary of Agriculture Tom Vilsack announced that hot iron branding was an acceptable form of future animal ID. History completely agrees with the secretary's findings. The western cowboy did not invent hot iron branding. The documented history of branding goes back for thousands of years. Scenes of oxen being branded on hieroglyphics are depicted on Egyptian tombs as early as 2,700 BC. Hot iron branding animal ID, for proof of title, has not changed for over 5,000 years. The book of Zechariah records this process in chapter 3 verse 2, "a brand plucked out of the fire." On a darker side of history, the use of a hot iron as proof of ownership went beyond cattle to an area people today prefer not to think about, the ID branding of human beings. From days of the ancient Greeks, Arabians, Romans and Egyptians, slaves were often marked as property with a small brand by their owner. The practice has continued in slave owning countries around the world. More recently branding has been used on prisoners and self branding which is termed "art branding" or "scarification." Hernando Cortez is credited with bringing the first branding irons to the Americas in 1541. His personal holding brand was three crosses. Branding became common in the US after the Civil War. Eventually, in Canada, the second session of the Northwest Territories government on August 1, 1878 established a law requiring all livestock to be branded. Brands of every shape and design were visible on every Longhorn that came out of Texas during the great trail drives. Spanish brands are often artistically designed with cursive, complicated circular characters. The western American ranchers chose simpler block and open shapes, which proved harder to alter and easier to read. Horizontal parallel pipe confinement is imperative for safety in handling Texas Longhorn cattle whether small or large horned.Â Most appendages are damaged or broken as a result of vertical parallel construction. Designs and names of brands are as colorful as the people who use them. The traditions and pride of ownership attached to brands is a volume in itself. Selecting a brand can be a simple thing or as detailed and historically meaningful as the owner desires. Most brands are based on the owner's or the ranch's initials. They may be a symbol, letter, number, character or combinations of connected or separate figures. A brand symbol, for example, may be a hat, fish, pitch fork, shovel, hook, bell, spur, staple, horse shoe, or wine glass. The list goes on. Brands are read like books from top to bottom and from left to right. Without a doubt, it is a historical, respected, language all it's own. A branding iron should be of quarter-inch clean iron made to the desired shape. 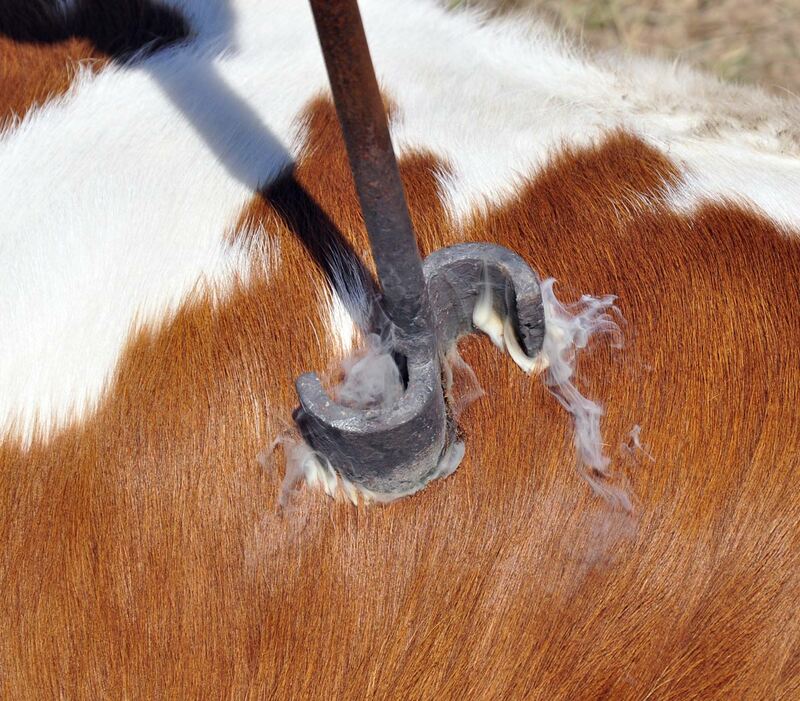 Small cattle should be branded with irons about 3" tall and larger adult stock can be about 4." A horse iron can be as small as 2". The handle should be about thirty inches long with an end grip holding device. When applied to stock, separate letters should be at least one inch apart so as not to appear attached. Notches or "breaks" are necessary on all irons where the bars join or intersect, about 1/4" to 3/8" wide. This prevents blotching in the corners. Letters like the top point of an A are particularly prone to blotch and always should be left open. Letters like L, C, U, I, J, S and open shapes yield themselves to clean readable brands. Simple brand codes may reveal to the owner information like pedigrees, year of birth, or ranch division where born. In order to keep the brand process simple and requiring minimal time to apply, fewer letters are always better. A single number indicating the year of birth is quite often used. The current year 2010 would be "0". At a glance the owner can easily know the year of birth. The year code can be part of the regular numbering system, over, under, in front of, or beyond the animal ID brand number. Brands are simple and can be recorded on a paper tablet providing a permanent record that lives well beyond the life of the animal. The numbering process is practiced by most ranches providing a non duplicate ID for every animal traceable through the records of USDA through the state brand registration system. Branding on the ground is the way most cattle have been branded for thousands of years.Â Young cattle are easily branded this way.Â This shows the correct restraining methods.Â The front cowboy holds the top leg, leveraged to the end, with a knee against the lower leg.Â The rear cowboy holds the top leg immobilized and fully extended while a boot holds the rear bottom leg forward to force the calf to be still for brand application.Â With a good crew this process could take no more than a minute. No ownership holding brand should be applied until legally registered. Registration is done in most states through the Dept. of Agriculture. A brand design is submitted for approval and recorded for a set fee, and only the recorded owner of that design can legally use it on their livestock. No two brands will be registered that are, or appear to be, the same design. In the eastern U.S. many states only have a few hundred registered brands, so it is easy to acquire a simple, clean brand. Colorado, on the other hand, has registered over 60,000 brands making it difficult to get a new brand with less than 4 letters. Texas, not to be outdone, claims over 230,000 registered brands on the books. Successfully applying a clear distinct ID brand requires the recipient to be still. In the open range, cattle were roped and laid on the ground for branding. Some of the best clear brands are done this way. The same process can be used in a small herd where the critter is physically laid down, not on the open range, but in a back yard corral. This is recommended for young calves, and not adults. 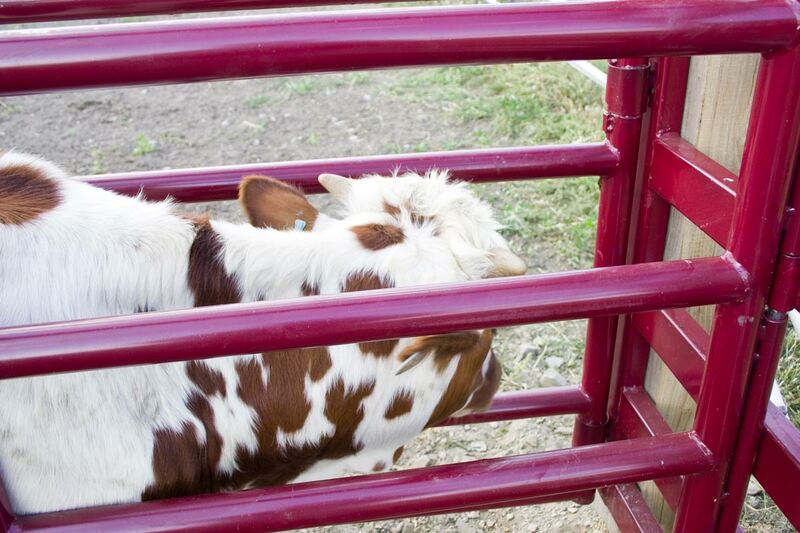 When adult cattle are branded, a metal squeeze chute is safe and efficient. The side squeeze chutes eliminate the head catch and restrain the critter better from head swinging. This provides safer name tagging, vapor tagging, and OCV tattoos. Plus, the side swing confinements are always the safest for releasing an animal from either side. A general purpose chute sells for $1250 to $2500. All processes in cattle care should be bloodless. Although tags and pins are numerous, each tag entry can puncture arteries, hide, muscles and pierce major ear cartilage, which always bleeds. With bleeding can come infection, insect attraction, irritation, or partial loss of hearing and ear function. The searing process of branding should never draw blood and is self sealing. It becomes a permanent ID in seconds and no medication should be needed in the future. Secretary Vilsack has wisely acknowledged the State Brand Inspection Systems (SBIS) are good animal ID. From the Mississippi west every state has brand laws and inspection procedures, with some dating well over a hundred years old -- well tested by time. 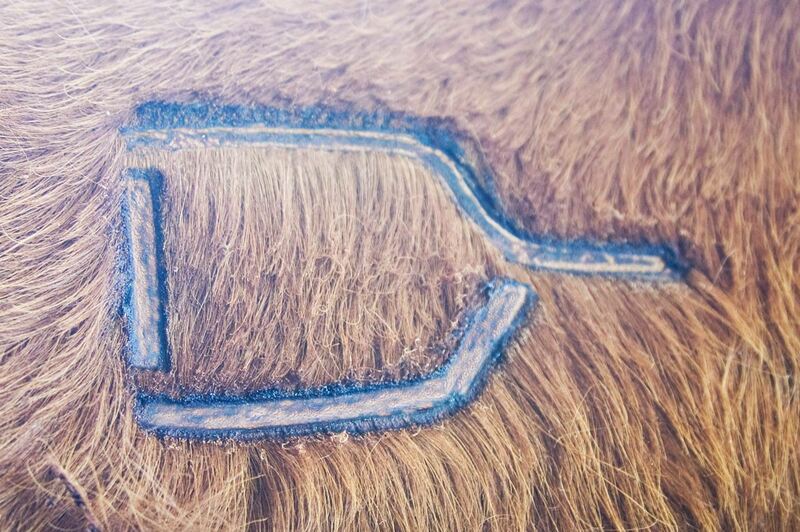 Branding is economical and a system currently in use by nearly every major cattle raiser. It doesn't require more fees, expanded USDA staff, computer education, high tech equipment purchases (not proven to perform under range conditions) or pernicious enforcement fines. The old brand laws work for all the right reasons. Last year SBIS visually inspected and documented 27,000,000 cattle according to James Clement, DVM. This brand shows that the iron was not hot enough, or was not pressed against the hide long enough to make a clear permanent ID. More irons have been heated with wood than any other way. A hot wood fire serves the purpose well. Today most people are in a hurry and use either electric irons or heat with propane. A small propane bottle will heat a lot of irons and may be transported easily without the limitations of an electric cord. The iron, when heated properly, should appear a light ash color. An iron heated in a flame will first accumulate carbon and appear very black. A black iron is too cold. It may be hot enough to burn or singe the hair, but not hot enough to penetrate the roots of the hair follicles, essential for a permanent mark. Red hot, yellow, or white irons should be cooled before use. A red hot iron may brand too fast. The beauty of clear clean brands comes with experience. It is impossible to make a rule for the length of time the iron should be held to the hide, because the condition of the hair and the temperature vary. To apply the brand, move the handle in a slow, rocking motion which will vary the pressure. A critter is not a flat surface so a flat iron may not clearly mark at all corners. It is better to remove the iron after a couple of seconds, check the mark and reapply the iron to the parts not adequately branded. Always error on the light side rather than over doing the time and pressure. With the first brand effort, test the result. Hand rub the brand and briskly remove the charred hair. 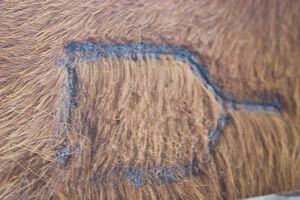 If the animal has been properly branded, a clear outline mark of the complete brand will have a saddle leather light rust color to it. This brand is perfectly applied. It shows the light rust color of the leather hide, has seared properly to prevent infection, and has not been pressed beyond hair root follicles. This will provide a permanent ID immediately after application and remain readable as long as the critter and the leather is of service. On the other hand, if the iron was not hot enough, only the hair will be burned and short partially branded hair will be in the brand design. Re-heat and place the iron exactly on the same spot and allow additional time. When branding is complete, a generous rub with bacon grease using a paint mitten will promptly soothe and lubricate the hide. An adult steer has hide 10 times thicker than a human. A good brand only enters about one tenth into the total thickness of the hide. Penetration of the skin's epidermis outer layer is the goal of a correct brand. Correct placement is below the hair and above the dermis tissue. Years ago there was some concern about fire brands reducing raw hide values. Now that the price of hides is only $8 to $14 there is no brand discount. Proof of title is the historic reason for a brand. It has worked for over 5,000 years. It is the best permanent ID for an owner's records. Permanent fire brand ID not only works on a live animal, but continues to be a valid ID on the hide after processing. Unfortunately, there are always unscrupulous people who want to steal or "rustle" livestock. In the fifth century BC, I Chronicles 7-21 records that the whole family of Ephraim was killed for "trying" to rustle cattle. Modern cattle rustlers, which are numerous, truly love the current highly promoted electronic ID. Any cattle rustler can easily remove, replace, change tags and electronic pins. To speed up the process rustlers order a Tag-Sav-R Ear Tag Remover from Nasco for $25.75. This jiffy tool was developed to back-out the pin arrow and allow a person to replace it into another animal. It only takes a couple seconds on most pins. To think the 840 pins are legal ID or even correct source verification is absurd. When a rustler is in a hurry to haul-out, it only takes a second to cut the whole ear tip off. That is not a permanent animal ID -- ask any successful cattle rustler. Special TSCRA Ranger Scott Williamson, who is working on several rustling cases in Texas says, "It is a great deal easier in court when stolen animals are fire branded. Prosecutors prefer to try cases where the animals have been branded. If you can prove to the prosecutor that he's going to be able to absolutely identify an animal in court, he knows he's not sticking his neck out to take the case." No type of animal ID has ever held up in court for a conviction, except a hide fire brand. Every major cattle producing nation on earth uses fire brands. The permanence and stability of a fire brand is superior to all other ID methods including the old "brite" USDA tags that are being newly promoted for AIS. So, after the smoke and the dust are settled, and all the government listening NAIS sessions are over, trust your neighbors -- but fire brand your cattle!